I’ve reviewed quite a few Kotobukiya statues in the past few years. They make lots of great Batman pieces, and their slowly-expanding line of Batman: The Animated Series stuff is especially sweet. The build quality and paint is always top-shelf, and I’ve thoroughly enjoyed everything I’ve laid hands on. But here at Comics Now, we love all sorts of characters and comics—not just those from Batman’s world. So I got curious—what are Koto’s Marvel offerings like? Are they just like what I’ve already reviewed? Are there differences? Come with me as I find out! So, after wrapping up some recent Batman-related reviews, I asked my contacts at Koto if they wouldn’t mind making my next one Marvel. They were happy to oblige, and a short time later, a tiny, blind New York City attorney showed up at my door. In terms of comparison, I couldn’t have asked for a better character. Daredevil’s suit fits with a snugness similar to Batman’s, and his pose is very similar to that of the Rebirth Batman statue I reviewed a few weeks back. So how do they compare? The body and facial sculpting is outstanding, just as in the Rebirth Batman. From certain angles, it even looks like an actual person—it’s uncanny. But like all of Koto’s ARTFX+ statues, this one’s modular—that’s a huge plus when it comes to paint application, because it’s cleaner (pieces are painted before they’re joined). The flip side is that sometimes, you can see the seams; and in the case of this statue in particular, you can really see them at the shoulders. For whatever reason, Koto ships this statue in four pieces—the two arms, and then the torso/head, and belt/legs, and I’m sure that this is a big part of what makes the shoulder joints so obvious. It’s not a huge deal, and you can display him at angles that minimize it. But it is more noticeable here than on the Batman stuff, all of which comes preassembled. The paint job on Daredevil is one of the best I’ve received on a Koto statue. The Batman statues typically use matte finishes on the cape, and those typically show blemishes very easily. It doesn’t seem like that would be a big deal, and ultimately, it’s not, but it’s always something I notice. With Daredevil, though, there’s not really any matte paint, and everything looks slick and smooth across the board. As I mentioned above, the modular design makes for perfect paint lines where different colors meet (boot and glove edges, the face peeking out of the mask, etc. ), and the color variance ends up looking very natural in its emulation of light and shadow. The Rebirth Batman statue feels very substantial in my hands. That doesn’t really matter when you’re just looking at it, but it makes you feel like you have something premium in your hands. Daredevil is much lighter, and while it doesn’t ultimately make me enjoy it any less, I couldn’t help but notice as I was handling it. The base looks great, which might sound like an exaggeration for describing a black square block. But I’ve never been a huge fan of square logo bases like the one used on the Rebirth Batman, so I appreciate the clean, unadorned look of this one. I wish the statue stuck to it a little bit better—the base rocks a bit if I lift Daredevil with it attached—but as with the weight of the statue, this doesn’t really matter once it’s in place. Daredevil comes with the one accessory that you would expect him to include: his rope-linked billy club/walking stick/grappling rod/thing. The rope between the two halves is actually wire, which makes it possible to pose to your liking, but I think I would have preferred something fixed here. It’s nigh impossible to manipulate the wire in such a way that you can’t see at least some kinking, and as such the wire seldom looks as good as the rest of the piece. Should you retain this attorney? So should you buy it? It might seem like I pointed out a few problems, but they’re all minor problems. The most significant is the shoulder joints, but once you get used to the way they are, you just don’t notice it all that much anymore. The statue looks so good overall that it’s easy to overlook something like that—especially if you choose a display angle that minimizes the issue. If you don’t believe my words, believe your eyes—just look at the pictures above. 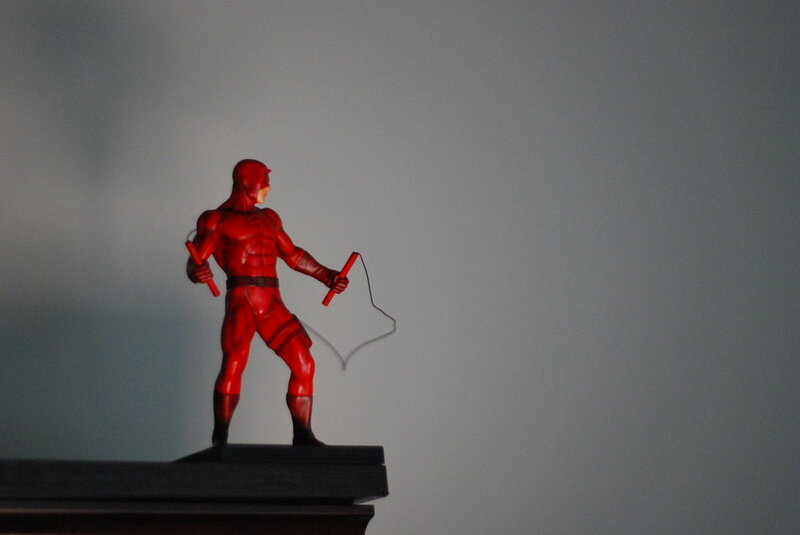 If you’re a fan of Daredevil, I can’t imagine you wouldn’t be a fan of this gorgeous statue.